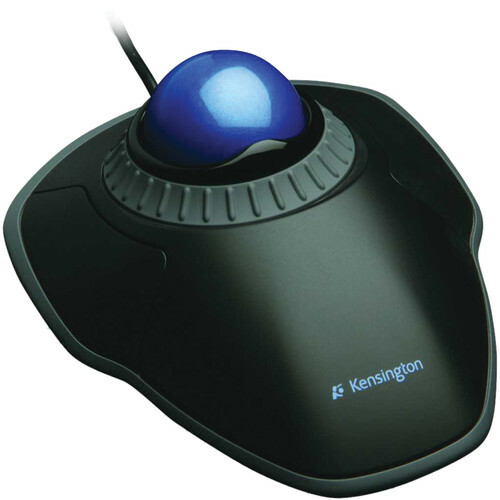 The Orbit Trackball with Scroll Ring from Kensington is a desktop trackball with a USB interface. It features a symmetrical design, making it easy for both right- and left-handed users to operate. Optical tracking technology and a scroll ring make it easy to move your cursor and scroll through web pages. It is compatible with Windows XP, Vista, 7, and Mac OS X.
Orbit Trackball with Scroll Ring is rated 4.2 out of 5 by 79. Rated 4 out of 5 by Samer from Create for tight spaces and lasso selections I use one on a desk that's crowded with three computers and several monitors with very little room left for the mouse, And the other on another desk where I do most of my photo editing Work. this trackball mouse makes making selections using the lasso tool or using the pen tool a breeze, Even matching the precision I get using my tablet and pen. However, there is a learning curve if you're new to trackball and you catch yourself trying to move the mouse itself. I would recommend it only to people who need it due to space limitation, need for precision, or any other specific use where trackball mouse can be superior to a regular mouse. Rated 4 out of 5 by Iolo from basic but oh! os useful mice are a pain, even the ones which have multiple buttons and so forth, because you always run out of space with them, or end up with your arm stretched across the desk, and about to knock off the coffee cup, too. Enter the trackball with scroll ring. XLNT! Versatile, easy to use, intuitive, comfortable. Mistakes you may make are not nearly so disruptive as what a trackpad can cause. Software could be better, seems too simple, but it does what it does without hiccups, so there you go. This one is basic and very useful, and on a budget! The really superior product is the 4 button version. Glad to have this one, and saving my money to get the other later. Rated 3 out of 5 by Anonymous from Love the scroll ring, don't love the ergonomics I've been using a Logitech Marble Mouse for 13 years. Had lots of them. I tried the Orbit Trackball because it has a scroll ring, something the Marble Mouse is missing. The buttons on the Orbit are set wider apart and flatter - not as well placed or comfortable. After a couple of days I went back to using the Marble mouse. Rated 1 out of 5 by Anonymous from Not for CAD This trackball is ok. Has the basics if you want to use it in place of a general day to day mouse. I bought it for the use of Auto CAD and found it's not really good for that. In Auto CAD there's a lot of need to push the scroll wheel down and this ball does not have a 3rd button to do that. My other issue I have with it is the little wrist rest that comes with it. It's molded out of a firm vinyl plastic material and does not secure very well at all. It kind of hooks into a groove underneath the base itself but it never stays in place. Rated 5 out of 5 by Andrew from Great bang for buck Lower cost alternative to more expensive trackball offered by Kensington or Logitech. Inclusion of scroll ring was major reason I purchased (aside from price). Some people may find ergonomic not to their liking but for myself it was a perfect fit. The basic feature already included in trackball was enough that I really did not find much need to install software from Kensington which is supposed to give additional enhanced feature. In use, I found the trackball to be accurate, smooth and with good response. I used it couple of hours everyday and have had no issue with my wrist at all. If there is any caveat, it would probably be trackball size as the ball is smaller than the more expensive Kensington trackball model. People with large hand may find it somewhat small for the size. Rated 5 out of 5 by Anonymous from very comfortable ambidexterous trackball Very satisfied with this purchase. The ball is large and comfortably operated with the palm. Scroll ring is also intuitive, and responsive, if a bit slow (haven't checked mouse settings yet - I assume this is a modifiable setting). I have also used the Logitech trackman pro, which is moved with the thumb, and locks one into right handed usage. I definitely feel the Kensington is more ergonomically friendly. Carpal tunnel concerns dissapear with this trackball. Like the wrist rest as well. Rated 3 out of 5 by Anonymous from Good mouse alternative I switched to using my mouse left handed to save my overworked right hand. When someone loaned me a track ball to try, I liked the reduced wrist motion and unlimited motion (you don't run off the pad and have to oar over to keep going). I was addicted to the scroll function, hard to find in left handed devices. This device has ambidextrous buttons and scroll. I have used it for over a week now, and learning has been quick. I don't feel as precise in fine pointer placement, but I am getting faster and more confident. The scroll ring does not seem to be very sensitive in that it takes a lot of movement before it jumps to the next click. At this time I think I will keep using it and prefer it over a normal mouse. Rated 4 out of 5 by Baron Rojo from The One to Try First I've never liked mice. I always thought a trackball was the solution for me, but by the time I bought my first computer, trackballs weren't very popular. At that time the first one I could get my hands on was the Logitech Marble Mouse, and I have been using it and its successor (now called the Trackman Marble; B&H carries them) ever since. I have no problem with the Logitech Marble; my only complaint ever was that Logitech could have found a place to locate a proper scrollwheel on it. But trackballs are finally gaining in popularity, selection is improving, and it was time for a change. The Kensington Orbit is generally similar to the Logitech Marble, but the Orbit has a Scroll Ring! -- a truly inspired way to add scrolling to a trackball. The Orbit is truly ambidextrous -- lefties can swap the button functions in software, and even reverse the function of the scroll ring. Those buttons are not as perfectly placed as those on the Logitech, however. They have a good, positive feel and movement, but the sound is...unfortunate. Having read other reviews of this trackball on this Website, I feel the need to point out that both the ball and the ring on mine operated smoothly and freely, with no break-in needed. Any jerkiness in scroll ring action is onscreen only. Download the TrackballWorks driver! It will give you extra button functions and the ability to reverse the scroll ring, as well as control over pointer and scroll rates. And it switches automatically to work on any Kensington trackball you plug in. Other reviewers have had trouble with TrackballWorks in Windows 7, but I got it working on the first try -- I actually had more trouble with it in Windows XP! The Orbit comes with an attachable wrist rest, of...simple...if durable construction, which doesn't seem soft enough for comfort. In practice, I found it more comfortable than expected but soon enough, I switched back to a gel pad I bought years ago at retail. The Kensington Orbit is the trackball to choose if economy is an issue, or for anyone trying a trackball for the first time. The only reason I gave it less than a full 5-star rating is the less-than-perfect ergonomics. Is this work with window 10 ? Yes, works with windows 10.